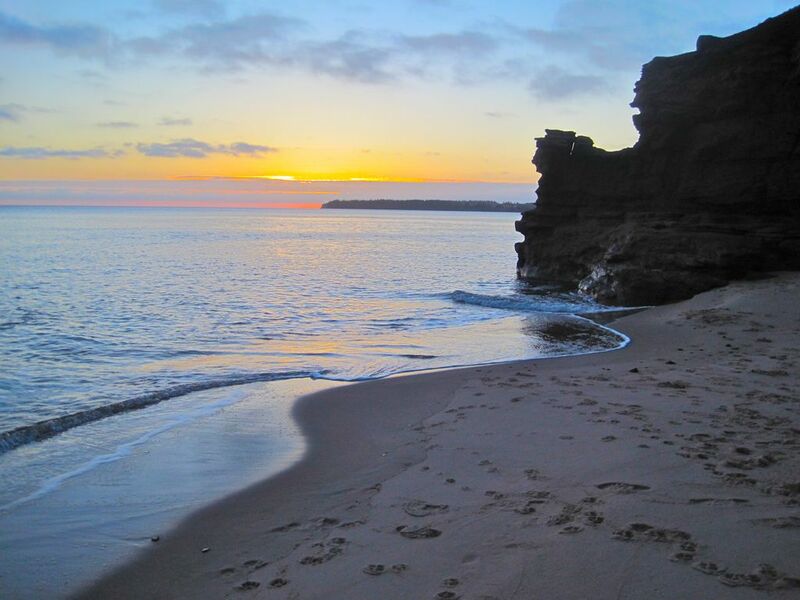 Escape to our executive, three bedroom (+ den) beach farmhouse overlooking a private, sandy cove in EASTERN, Prince Edward Island (PEI). A gourmet kitchen anchors the main floor with 10' ceilings and walk around island stone fireplace. All stainless steel appliances in the kitchen are new. The kitchen is equipped with Paderno cookware and accessories, all the amenities a cook could want. Two full bathrooms include showers and luxury air tubs, a nice way to unwind after a day at the beach. Second floor window seats with a view offer a quiet space for reading and relaxing. The master bedroom has a king size bed, window seat and walk-in closet. The second bedroom has a double/twin bunk bed. The third bedroom includes a queen sized bed. The fourth bedroom/den has a double bed (Murphy style) which pulls down from the wall. There is also a colour TV, with satellite, a DVD player,VCR and stereo system. All bedrooms are internet-ready, for those who like to keep in touch on their holidays. A wrap-around deck offers spectacular views both east and west and Weber gas barbeque allows the 'Chef' to cook outside. Beach chairs, beach towels, sand toys. What a great experience renting the Farmhouse at the Cove. From booking to check out our hostess was friendly and wonderful to deal with. The house itself is exceptionally lovely with a well equipped gourmet kitchen for those who like to cook. The beach, which is a few steps away, is one of the most beautiful we have ever seen. Hoping to visit again soon. Loved the cottage, better then expected, loved the beach , loved the ocean sounds at nite. Loved the cottage , great kitchen , loved all the windows around the house. Being steps from the ocean is the best doesn’t get better. My husband and I loved the privacy . One draw back was the grocery shopping and lack of section. Keep in mind before coming . The most relaxing place on earth! We return every second year to Souris and the farmhouse, and those memories are always engraved in our hearts forever. The house has everything you need. Beautiful inside as well as the yard. Nice trail to the beach. Highly recommend. Both the house and location are incredible. The house is well-equipped and the owner was very responsive to our needs. We will visit again! We were a group of friends from PEI and NS who spent a wonderful weekend at the Chef's House! The house was clean, comfortable and beautiful. The amenities were all modern and the gourmet kitchen had everything one could need. The beach is one of the most perfect on PEI. The owner was wonderful, and did everything she could to make our stay very special! We had a great time!